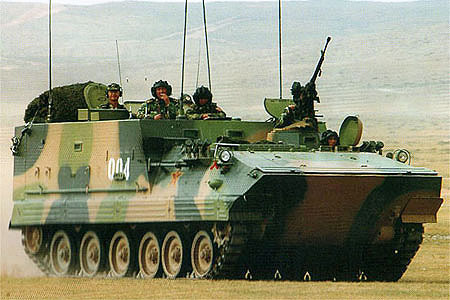 The Chinese Type 99 Command Vehicle is operated by The PLA based on the ZSD89 (Type 89/YW534) armoured personnel carrier (APC). It is a stretched hull and six pair of road wheels. The rear compartment has been enlarged, with a raised roof to provide more comfort for the passengers. The detailed information on the equipment onboard the vehicle is not available, but it is believed that the vehicle is fitted with latest digital communication systems and wireless computer networks. The vehicle has a 12.7mm anti-aircraft machine gun and two 4-barrel smoke-grenade launchers for self-defence.